March is prime freshwater fishing season for many species of fish, because bass and bream are getting geared up to hit the shallows. During spring, sunfish such as bass and bluegill move close to shore to find suitable spawning habitat. Shallow areas (ideally 2 to 6 feet deep), with sandy or firm soils and nearby vegetation, tend to attract sunfish. Often the same areas are used year after year, because sunfish do best when they construct beds in sheltered areas without too much current, such as in coves, and away from prevailing winds (often on the north shores of lakes). 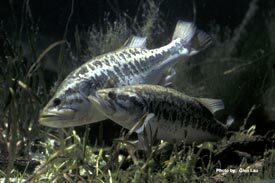 Beds for both bass and bream are constructed by males, who protect the eggs after the females come for a conjugal visit. Bass typically spawn before bluegill, preferring water temperatures of about 60 to 65 degrees, whereas optimal temperatures for bluegill spawning are around 65 to 80 degrees. Redbreast sunfish, redear sunfish and crappie may also be in the shallows during this time, and normally precede bluegill. The moon also influences these species to some degree, with full and new moons generating the most activity. Most anglers know this and are reminded on the nightly news through fishing/hunting peak-time reports. This March should be a great time to go freshwater fishing in Florida. Please remember that although there are currently no closed freshwater fishing seasons, it is always good to follow basic angling ethics and rules.